113 Cream Sponge Cake Aunt Addie 2 eggs broken into a tea cup & the cup filled with sweet cream. 1 cup sugar. 2 even cups flour. 1 teaspoon cream tartar 1/2 teaspoon soda. Bake in square tins. Dried Apple Cake No. 1. Aunt Addie Soak 2 cups of apple over night. In the morning chop fine and add 2 cups of molasses & let simmer 2 or 3 hours. Then add 1 cup milk, 2/3 cup butter. 2 eggs 2 teaspoons soda, 5 cups flour and spice to taste. Apple Cake . No. 2. 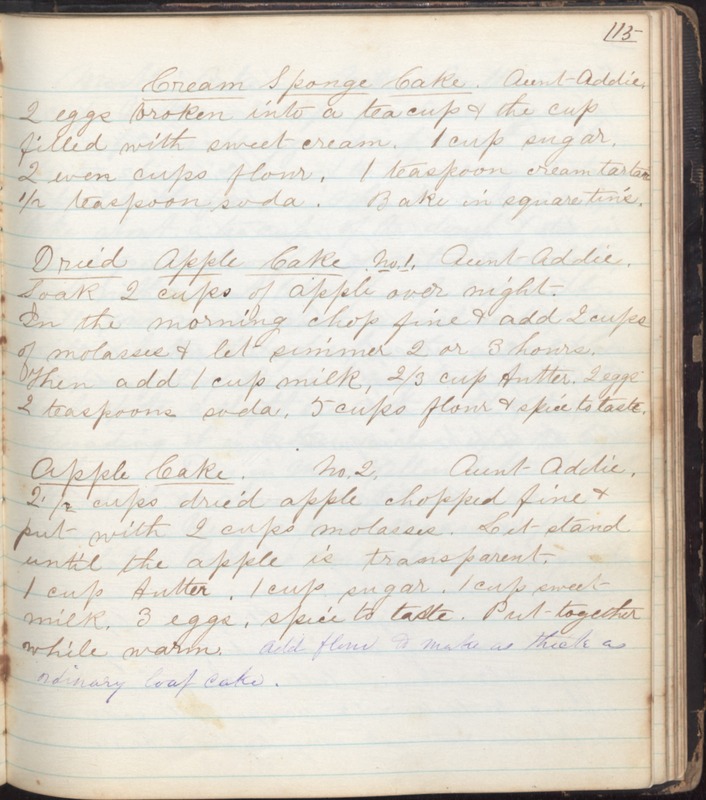 Aunt Addie 2 1/2 cups dried apple chopped fine and put with 2 cups molasses. Let stand until the apple is transparent. 1 cup butter. 1 cup sugar. 1 cup sweet milk. 3 eggs. spice to taste. Put together while warm. Add flour to make as thick as ordinary loaf cake.